For the past two years, I’ve experimented with a number of tools to animate scenes, lectures, exercises. I’ve done this partly because I did not want to have to produce real videos – I found production and post-production overwhelming & because I like to see results quickly & because I like animated films. I liked one animation software in particular because of its ease-of-use, the simple interface and the emphasis on story: Plotagon. It turned out that my students found it really easy and attractive too! So now I’m using Plotagon regularly in class & let the students create their own videos. Here is a description of Plotagon followed by a bonanza of examples created in or outside of class by students & by myself. Plotagon Education and Animate Your Classroom are two apps, created by Plotagon, that lets students and teachers create 3D-animated videos just by typing out the manuscript. The Characters in the app speaks out the written text in English or if you like you can write in any language to record voices of any language too. Creating an animated video with Plotagon Education or Animate Your Classroom takes only a few minutes. 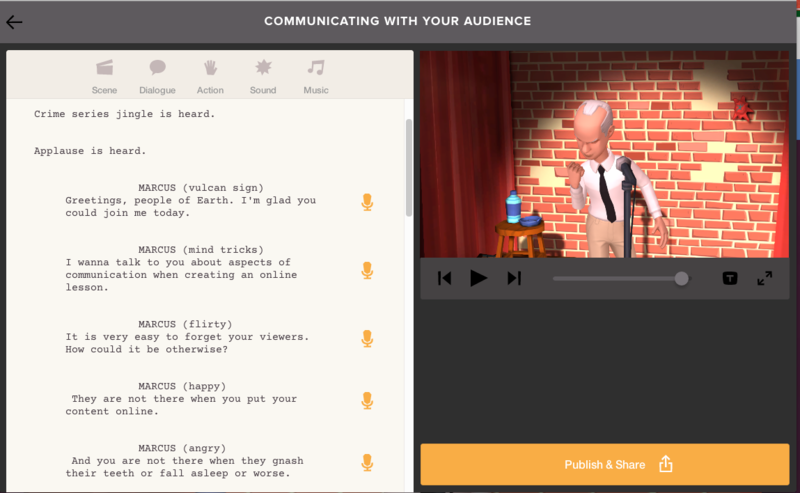 Users simply choose some characters, select their scenes, type words for their characters to say, and press play to see a script performed as an animated story. A wide variety of scenes and pre-made characters are available. Users can also create their own characters as well, choosing from a wide variety of facial features, hair, clothing and accessories. Videos can be stylized by adding emotions, actions, music and sound effects via simple pull-down menus. The app Plotagon Education runs on iPad, iPhone, Mac and PC. It includes a private, digital community where student videos are only shared among classmates for peer review and feedback, while the teacher can both engage in and monitor all activity. The app Animate Your Classroom runs on iPad and iPhone and is specifically made for classroom with shared iPads as there is no login or user account. Instead users makes a video and immediately saves it to Camera roll. From there users can share their work any way they like. Plotagon was founded in 2011. It is headquartered in Stockholm, Sweden. Plotagon Education is available on Twitter (@PlotagonEdu), Facebook and Google+ to provide information, ideas and support to educators. Want to know more? Please visit https://plotagon.com/education. Now, how can you use Plotagon in class? Here are a few scenarios with examples – note that the examples are mostly not fully worked through animations but rather “quick and dirty”. I don’t have high expectations regarding professionality when it comes to films – really professional products take more time and passion than I have for this medium. I take a pragmatic approach: I like to see results quickly and I expect that my students can work with these tools (for a reasonable price, too, or, ideally, for free). For the examples, let’s look at some simpler ones first and get to the more advanced ones later. Videos to introduce something or someone. Image: Dashboard for Plotagon script. I like it when the projects are not made up & artificial but if they answer a real world problem. The easiest way to do this is to work with real company. The students who created the following video examples were doing consulting work for real companies. These videos were created in class after the demonstrations above, in the course of one hour. The students were re-developing website application processes for a Berlin-based start-up incubator called Social Impact Lab. (The project was brokered by another social startup, Link-Projex). This was their first video with Plotagon ever. Also, they did not have access to many scenes or characters yet. The film is still remarkable, because it involves a number of scene changes and relationship development in 1.5 minutes only! The next example is by another group of students from the same team, on the same project: remarkably, their film has the same length and, though the two groups work on the same project together, it shows a different take on the problem of the incubator – more process and less product focused. As a story, the relationship between the characters is quite important — the relationship is used to illustrate the process of getting motivated to participate in the web based application process. Fancy films – more story, more yield. The last three examples – two by students, one by me – are clearly fancier and also much longer. By this time, the students had access to the full character and scene sets available on Plotagon for subscribers (and also for free riders, but at a price, as on-site purchases). The videos were not created in class but independently outside of class over a period of several weeks. The student project is still “A website for Social Impact Lab” as before. This video is considerably longer and clearly took more time to create. The focus is not so much on the process but on selling the team’s idea to Social Impact Lab, namely to create a team space where start up ideas could collaboratively be worked up towards a funding proposal. This is why the emphasis of the story is on relationship but in a different way than before – the team allowed itself more time to build relationships between the characters than in any of the previous examples. The team said this took them between 2-4 hours production time. Note: the subtitles of this recording are automatically generated (and therefore often wrong). This is an early example which stands on its own because the students used Plotagon and created a film alternating between dialogue scenes and screen casts demonstrating the use of a customer relationship management (CRM) system called CRM Express. This video was part of their online lesson on CRM systems in a course on business information systems. Doing something like this requires video editing software and (much) more skill and time. Still, the effort should be much less than producing and editing real video shots. Note: the subtitles of this recording are automatically generated (and therefore often wrong). This last example was created as part of an online course on research methods for master students. One of the methods discussed is survey research: The video illustrates a number of issues students are facing when they create surveys as part of the thesis research. There are different scenes, different characters and even a little love thrown in at the end. This is probably the most advanced plot that I have tried to create so far. Looking at it now after working with students and seeing what they can do, I feel inspired to do a lot more! Playlist with all videos discussed in this article. StoryCenter, a digital storytelling hub since 1993, based in Berkeley, CA (since 1993). Digital Storytelling MOOC from the University of Birmingham on FutureLearn (2016). The Future of Storytelling MOOC from Potsdam Univ of Applied Sciences on Iversity (2013). The Leader’s Guide to Storytelling by Steve Denning (Wiley, 2011).